Search engine optimization is one of the key forces in driving traffic to your website. The better the SEO, the better the traffic, and more importantly, the better the conversion of that traffic on your site. Whether you are looking for increased phone calls, mapped directions to your front door or your only KPI is increased sales, growing your visibility on the search engines is the most effective and efficient way to reach those goals. But SEO can be a tricky, and an often expensive project, with thousands of companies out there telling you they have the “get visible fast” trick which ultimately costs you more money that you than you feel you can justify – isn’t there another, less expensive way to boost your search results? Actually, there is, and it doesn’t have to cost you much money. First it is important to address a couple of areas of visibility that often confuse small businesses. That is the difference between organic and local search – and yes they are different, but complementary strategies. Many companies and products will assist you only with organic search – organic search means creating visibility only as it relates to search terms – i.e. organic latex mattresses or home-based bookkeeping businesses or even Chevrolet Volts. Local search, on the other hand, are search results based on “near me” or location based searches. Those are often the best type of searches, regardless of the product that you are selling, because those searches are farthest along the consumer journey and are likely ready to make a purchase. These are the searches that drive in-store or on-site buyers. It is extremely important to include a local search strategy in your optimization plans. Why is local search so important? Primarily shoppers of all products have redefined loyalty as convenience – where is it easy for me to buy that product or hire that service. According to Google, “near me” searches doubled in 2015. People are going to trust the results of what is near them. “Near me” searches are often conducted on a Smartphone and 72% of of adults use that type of phone, and check their phone 110x’s per day. Google also says that 50% of shoppers that do a “near me” search will actually visit the business and 18% them will make a purchase, within the next 24 hours. 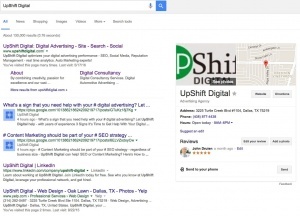 There are a few steps that you can take to improve your local search results. One place you want to start is making sure your business is in on the local business directories. Hubspot offers a list of what they consider the top 50 directory sites to list your business. There are multiple good directories on that list, but also several that charge fees or require you to use a service like Yext to add the directories. We do not recommend using Yext. They will run a “scan” of all the business directories and your business for you, at no charge, and often the results are incorrect. They will then begin spamming your email box requesting you fix your visibility. Be aware that there are very high fees for this. Some directories will not allow you to use them without Yext. Our advice, just ignore those sites, it isn’t worth the trouble. The good news is that the team at UpShift Digital can also assist in this process for fees much smaller than you can imagine. The two most important sites to begin optimizing for local search are Google and Yelp. These are also both review sites and according to BrightLocal, 92% of consumers read customer reviews before making their purchase. Having profiles on both of these sites will give you a platform for encouraging customers to leave reviews, to which you must respond (good or bad). Google is also very important in creating relevant search results for your business, therefore that is the site where you should start first. On your desktop, go to Google my Business, and claim your business. It is amazing how many businesses out there have not claimed their own business yet. Once you claim it, you will be required to verify that the business is yours. This can be done by phone (in some cases) or by getting a post card in the mail within 5 days. Once you get your card, you will have a number on it that you will place into your Google my Business profile, and therefore verifying your listing. Once you have verified you will want to completely fill out your profile, including real photos, information, etc. This will all improve your visibility and create a trust factor with your potential customers. Nothing causes someone to move on more quickly than a blank profile. Especially on Google. We will write a future piece on the important characteristics of your business directory profiles. Several of these sites will require you to verify your account before they will let you complete your listing. This is an important safety feature to ensure that your competition does not claim your business, and add incorrect information. While verification is required, there are still ways to work around it. You will notice that we did list Bing as an important directory profile to create. While Bing does have a much smaller audience than Google, the audience is likely a much more apropos to your product. According to statistics, 72% of Bing’s users are 35+ and have an yearly income greater than $75,000. Optimizing for local search, starting with the list of business directories we have listed above, is a great way to begin capturing those active buyers that are conducting “near me” searches. While many of these sites are free to create a profile on, it can still be a time consuming process, especially if you are going to take full advantage of all of the site’s features. We at UpShift Digital have created a process where we can create your business listings for you, at a very affordable rate. As experts in the industry, we have created thousands of these listings, and immediately increased our clients’ local search results. We can set up each profile for a one time fee of $10 (minimum of 5 directories set up). All we need is your logo file, several images of your store, inside and out, your products and your team. With a link to your website, we will capture information about your business, and create a consistent message across multiple directories. Click on our Contact Us page to find out more!